Anna Leigh Tomalis’ story begins before her illness. To those who did not know her well, she may have looked like an average 10 year old girl but to those close to her Anna was known as a bubbly, bright, “knows what she wants” kind of girl. Anna was a beloved daughter; a role model to her younger sisters Julia and Megan; And she was a friend to countless classmates, teachers, and anyone else she met. Anna enjoyed fashion, horses, playing the piano, soccer, interacting with friends and had a passion for living that never quit. Even through her illness she was as sweet as candy and mature beyond her years. In September, 2005 Anna’s life changed when she was diagnosed with a very rare tumor called “Embryonal Sarcoma of the Liver”. It is primarily a tumor found in children, although some adults are diagnosed with it too. It is so rare, that only about 10-15 children a year are diagnosed with it in the United States. After a six hour surgery in a standing-room-only-OR, the tumor (or Mr. Bob, as Anna called it) was removed. Rare complications followed and Anna soon had a biliary drain for over a month while parts of her insides healed. She needed a tube in her nose to her stomach to receive special food (she didn’t like that very much). Through all of this Anna was brave – she would even go to school – drain, tube in her nose, no hair, bandana and everything. In November, Anna started chemotherapy which required five day stays in the hospital, filled with intensive sessions. Along with the chemotherapy came many different complications that kept Anna in and out of the hospital including low blood counts, replacing her central line through which she received the chemotherapy, and phlebitis (vein inflammation), among others. Despite this, she was lucky enough to find the time to play with her friends and do a lot of the things kids without cancer would do. In August, 2006, by a complete fluke, Anna was diagnosed with a metastasis in her hip. She went on her “Make A Wish” trip immediately after this and returned home to more chemotherapy, radiation and trips to an orthopedic specialist. In between trips to the different doctors, she went horseback riding, out with friends, to sleepovers and other things. In January of 2007, she was diagnosed with another metastasis – this time on her spine. Different chemotherapy was begun, which had her in the outpatient department almost five days a week for about six months. After this, she was clear until December 2007, when she was diagnosed with another metastasis. During this period she enjoyed swimming and horseback riding camps and lots of other fun stuff. More surgery, radiation and chemo followed along with multiple other issues. She now had a “Wound Vac” from a biopsy site that would not heal. In spite of this, she went to Disneyland in Florida and was even able to enjoy time with the Dolphins and Flukes. She went to Fashion Week in New York City and met her favorite designer – Betsey Johnson and Tyra Banks too! She brought her best friend (a boy!) to a Redskins game, where she and her friend go to meet his favorite player. She had it all arranged for him! She went to congress to petition for a drug for Compassionate Use. Later, she was also diagnosed with tumors in her lung. These made breathing harder. 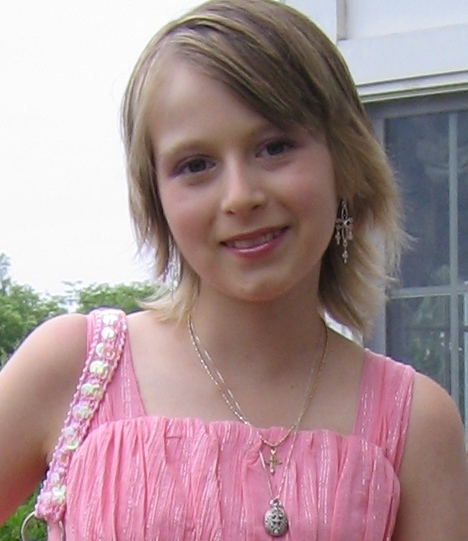 At the end of her treatment, Anna received an Investigational Drug. She was to receive her second dose of this Investigational Drug the day she passed away – August 15th, 2008. Through all of this, Anna was filled with charm and grace, humor and kindness. She humbly accepted what had happened and what was happening to her.